With all the rain we’ve been getting ’round these parts, this summer has been unseasonably cool so far! Once the storms dissipated, the sun appeared and has not been muddled by clouds or rain ever since. It’s been lovely! Because the summers in Texas are usually a scorcher, I picked up two new crop tops for the season. The first one is this twisted satin poplin top by Tibi. The second one is also Tibi, but it has an adorable tie-front detail. Both look amazing with breezy skirts and will keep me cool this summer until I leave for London. This one is wonderful because it almost looks like it’s actually tucked into whatever skirt I’m wearing. I truly hate the look of tucked-in shirts on myself, simply because I’m incapable of making it not look bulky. Thus, crop tops are ideal! Especially for summer when I definitely don’t need any layering happening. Tibi just kills it in the crop top department. A few other cropped favorites right now include this macrame applique top for fall, this light off-the-shoulder top, this organza ruffled cami. Nice crop top. Perfect for the Texas het. Such a cute outfit! I love the black and blue together and that crop top is just perfect! Can’t believe this is a crop top! It looks like the most beautiful fitting dress and I love the subtle color blocking :) Happy Monday! Favorite outfit post to date. So pretty! At first sight, looks like dress! That top and skirt meet each other at the right point! That skirt is gorgeous and love that fun clutch too! Love this outfit, but I love the off shoulder top you linked here..such a beautiful piece! I hope you guys are done with the deluge of rain and flooding..scary..
love this silhouette. Such a classy take on the crop top trend. Gorgeous as always! I wish like 75% off my closet could be Tibi! 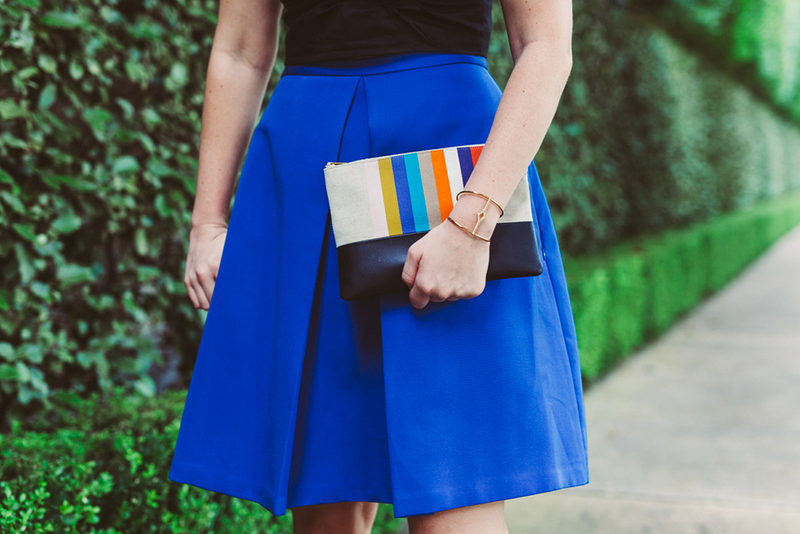 Love the cobalt skirt – cobalt is such a fun color for summer! I can’t seem to get enough of it! Beautiful look, Merrit! Love it! Stunning! I love this skirt, especially the inverted pleats! So pretty! What a gorgeous skirt! The color is vibrant, but the structure is what really makes it stand out. Love this bold blue color on you! This is so stunning! I adore it! Love the cobalt blue on you, so pretty! I love tibi too, the esthetic is such a great combo of modern/classic. I’m loving this outfit on you, and the clutch is the perfect finish. Had you not said anything, I would have thought that the crop top was an actual full length top that you tucked in, OR, I would have thought “Dang, that’s an awesome cut dress.” Looks fantastic. Love everything about this look! it’s so feminine and fun. Tibi is killing it in general lately, don’t you think? My favorite go to pieces lately. I am the same way about tucking in shirts, by the way. Hate the bulk on me. Merritt, you look stunning! That blue is divine on you. Such a perfect combination! I’ve never seen such a sophisticated take on a crop top and I love the jewel tones. Great outfit! Love the blue!